I don’t always post memes on the internet, but when I do, I prefer to create my own. With the semester rapidly winding down, I find myself looking back and thinking about what went well, and what I could do better the next time. I had a great class, and two fantastic labs to boot. As always, I spent a lot of time preparing slides, but hopefully that had a positive impact on my students’ understanding of the material. My original meme which I put together at memegenerator.net. I was floored. Here was a photo that just begged to be used in my presentation. High resolution, already formatted for my slide deck (I go with 1920×1080), no wording or logos to have to mask out, and best of all, it’s awesome! All I had to do is add my “stay curious” line and I’m done. Original poster ad that got me thinking more bout my meme. This photo is perfectly suited for my slide format as well, but I would have had to figure out how to remove the branding without ruining the rest of the image, and professor just ain’t got time for that. 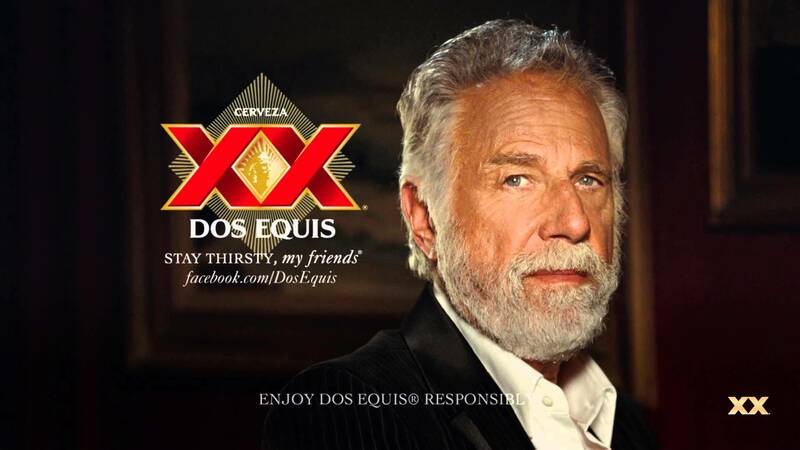 But now I could see how the stay thirsty, my friends tagline was presented. 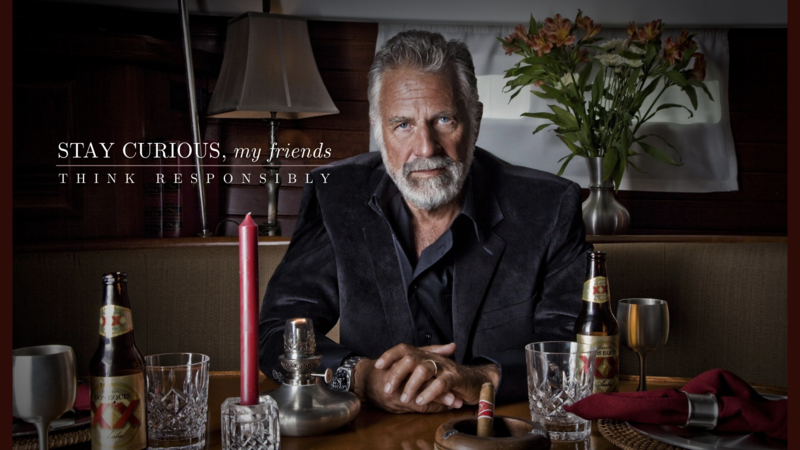 And I also noticed the enjoy dos equis responsibly message at the bottom, which immediately inspired me to add my own think responsibly message. I rather like this new slide. It’s a departure from the typical meme format but I think it does the photo justice while hopefully driving home the message. I hope my students continue to stay curious, seek out the facts, and take truth over ego any day. 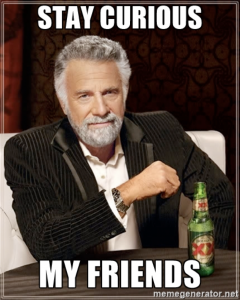 Then again, they’re young millennials in college, so I really hope they know this meme to begin with.